"Flexible helping with understanding of conspecifics' goals in chimpanzees"
Humans extensively help others altruistically, which plays an important role in maintaining cooperative societies. Although some non-human animals are also capable of helping others altruistically, humans are considered unique in our voluntary helping and the variety of helping behaviors we demonstrate. Many still believe that this is because only humans can understand others' goals due to our unique theory of mind abilities, especially shared intentionality. However, we know little of the cognitive mechanisms underlying helping in non-human animals, especially if and how they understand others' goals. The present study provides the empirical evidence for flexible targeted helping pending on conspecifics' needs in chimpanzees. The subjects of this study selected an appropriate tool from a random set of seven objects to transfer to a conspecific partner confronted with differing tool-use situations, indicating that they had an understanding of what their partner needed. This targeted helping, i.e. 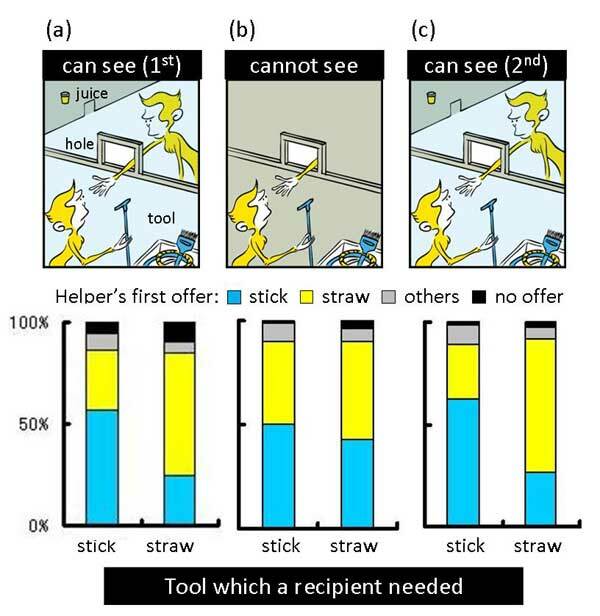 selecting the appropriate tool to transfer, was observed only when the helpers could visually assess their partner's situation. If visual access was obstructed, the chimpanzees still tried to help their partner upon request, but failed to select and donate the appropriate tool needed by their partner. These results suggest that the limitation in chimpanzees' voluntary helping is not solely due to their failure in understanding others' goals. Chimpanzees can understand conspecifics' goals and demonstrate cognitively advanced targeted helping as long as they are able to visually evaluate their conspecifics' predicament. Yet, they will seldom help others without direct request for help. Appropriate first tool offer in the "can see" condition. Upon Pan's (right) request, Pal transferred a straw, with which Pan succeeded in obtaining the juice. Inappropriate first tool offer in the ĄČcannot seeĄÉ condition. Cleo (left) first offered a straw to Chloe. As Chloe continued requesting, Cleo transferred a hose, a brush, and finally a stick, which Chloe actually required.